Influenced by the dip angle of coal seam, the rib spalling and roof falling of the large-cutting-height panel is prone to occur. The surrounding rock control is a major problem in the mining of large-cutting-height panel with large dip angle. Based on this, ground pressure behavior law in the large-cutting-height panel with large dip angle was studied through laboratory test, numerical simulation and field measurement. 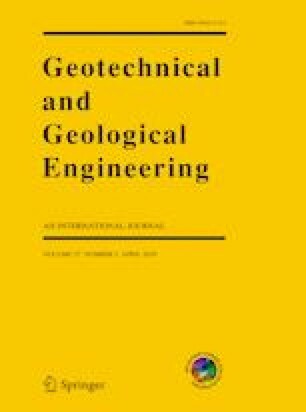 The results show that the unidirectional compressive strength and shear strength of mudstone are low, the cohesion and internal friction angle are small, and the joints and cracks are relatively developed, thus, the roof is easy to be destroyed during the mining of working face; influenced by the dip angle of coal seam, the stress concentration degree of the upper and lower ends of the working face is different, and the initial roof weighting interval is about 40 m and the periodic weighting interval is about 20 m; the front abutment peak coefficient pressure of coal face is about 2, and the peak point location is about 15 m away from coal face, and the influence range of abutment pressure is about 40 m, and the strong influence area of abutment pressure is 0–16 m; affected by mining, the cracks in the roof are relatively developed and then broken, which causes roof caving accidents. The research results can provide theoretical basis for surrounding rock control of stope under similar conditions. We acknowledge the financial support from the Scientific Research Foundation of Guizhou Provincial Department of Science and Technology and Guizhou University (QianKehe LH 7280) and the annual academic training and special innovation program of Guizhou University in 2017 (Guizhou Kehe 5788) and The Youth Science and Technology Talents Development Project of Guizhou Education Department (Guizhou Education Co-operation KY character  114) and the fund of Key Laboratory of Safety and High-efficiency Coal Mining, Ministry of Education (JYBSYS2017101) and The first class professional “mining project” in Guizhou Province (SJZY2017006).